Home News Mynt Martini coming to Fountain Square? Mynt Martini coming to Fountain Square? 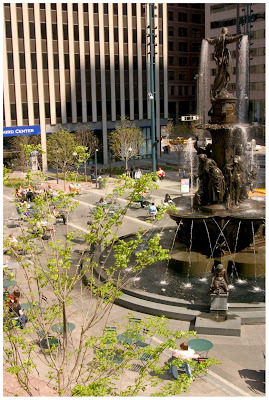 Fountain Square has been transformed over recent years into a vibrant hotspot of activity and it maintains the status of being the spot where people meet and socialize when hitting up Downtown. The new commercial spaces, fronting on the Square, have injected new life from the outdoor dining, mixture of retail uses, and programmed activities. But there has been something missing – that nightlife component that puts a constant stream of activity right on the Square after hours. There is one commercial space left on Fountain Square and its tenant may fill that missing void both physically and socially. The space is 17 Fountain Square Plaza which is adjacent to the 5/3 Banking Center and across the walkway from Rock Bottom Brewery. The transfer request includes the ability to sell liquor, wine, beer, and the ability to stay open late (until 2:30am). Individuals associated with the Fountain Square Management Group stated that 5/3 tenants their building and declined to comment further. No response has been received from 5/3’s leasing agent Chris Hodge from CB Richard Ellis. Follow ups have been made and UrbanCincy will update this story as it develops.